My mama was the very first Queen of the Cochon de Lait (or, Queen of the Roast Suckling Pig, or just plain “Pig Queen,” as we like to call her) in 1951. I am royalty in the line of pageant swine. For reasons totally unrelated to my hog heritage, my favorite cashier at Dominick’s calls me Miss Pork, and frankly, I’m flattered. So it is with great pig-love and affection that I share my first foray into the family tradition of sausage-making (without the safety net of the “scoot over and let me show you how to do it” aunts and uncle who taught me the craft). 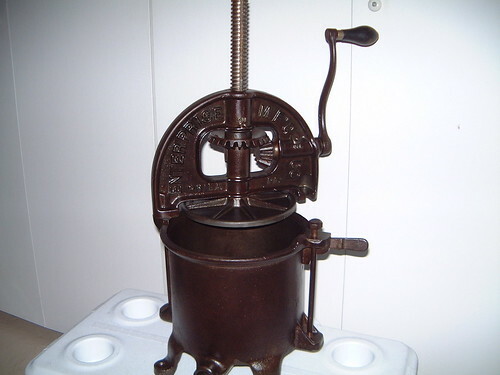 The story begins with a humble, very rusty cast iron Enterprise Sausage Stuffer and Fruit/Lard Press, procured from Gramma’s Attic antique store in Ottawa, IL. This is the type of stuffer my grandfather and his family used back in the day to make sausage after a traditional boucherie in Mansura, Louisiana, and our family still swears by the old cast iron beast. My only regret in this whole project is that my Uncle Ed, who was the first to teach me the art of sausage making, never saw pictures of the stuffer. He died very suddenly last fall and the shock of his death is still reverberating through the family. I guess we all deal with grief in our own way, and my way was to honor his memory with a sausage-making party. Three adventurous friends and sausage-making virgins—one, a vegetarian, and all women of different ethnic heritage—showed up with family recipes to make. A Hungarian, a Filipino, a Norwegian, a Louisianian…sounds like the start of a bad joke, but the diversity made for some fine sausage. I bought 60+? lbs. of pork shoulder at Halsted Packing House and had them bone-out, trim and grind the meat (a coarse “chili” grind), so I ended up with about 40 lbs. of ground pork. The butcher ground the meat and fat separately, which allowed me to “add” as much or as little fat to each recipe as desired. I probably didn’t add as much fat as I should’ve (the sausage is a wee on the lean side for my taste; everyone else seemed to like it fine), but the smell and sight of a bag full of ground pork fat nubbins is not for the faint of heart. The casings were another issue. The two hanks I bought from Paulina Market had been in the freezer for a while, and appeared to be dried-out when I started soaking them. I was afraid they would tear or burst, and by the time everyone fiddled with the casings and made the requisite jokes about their prophylactic capabilities, they were in a tangled heap. Fortunately, someone made a call to the meat department at Fox & Obel to see if they sold casings. Not only did they sell us two pounds of casings at $4/lb (unbelievably cheap, and far more than we needed), the casings were pre-tubed! I have double-checked with the meat guys at F&O to make sure this wasn’t a one-time fluke, and they assured me that they would sell the pre-tubed casings to anyone who asked for them. The first batch we made was a Norwegian potato sausage. We ground par-boiled potatoes and onions using my Kitchenaid grinding attachment and mixed it with the remaining ingredients (pork, beef, salt, white pepper, allspice). Next time, I would use a bigger dye to grind the potato-onion mixture because the texture seemed to allow for too much moisture in the mix. We also mixed up batches of longaniza, a Filipino breakfast sausage, an Asian sausage from Aidell’s Complete Sausage Book (minus the shrimp), and the family recipe that I grew up making (a mixture of cayenne and black pepper and red pepper flakes). Here, we test the mixtures for seasoning and tastiness. I should’ve noticed the lack of fat, but we were at least a few beers into the process, and my pork fat discerning capabilities weren’t 100 percent. 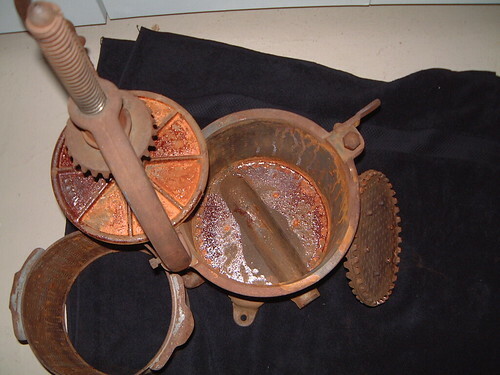 We also discovered, after several batches went through the press, that the plunger plate we were using was the “small” version—used for pressing fruit—not the larger plate needed for stuffing sausage. The larger plate allows less of a gap between the walls of the canister and the plate, so there’s not as much meat squishage up and over the edges. The stuffer didn’t come with the large plate (I’ve ordered one through Chop-Rite, the company that bought out Enterprise and owns the original designs, and sells replacement parts), so after some tinkering with the set-up, the clever Hungarian came up with the Dominick’s Bag Solution. 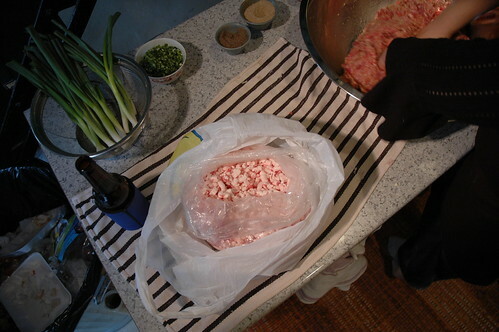 We laid a few layers of clean bags over the top of the meat and “tucked” the sides down the inner wall of the canister. It wasn’t 100 percent effective, but it did prevent most of the squish. Our first spiral (I believe this one is the longaniza, a delicious, vinegar-y breakfast sausage) drew oohs and aahs. If you look closely, you can see the squishage coming up over the plate in the stuffer (this was pre-Dominick’s bag). All in all, the sausage-making party was a smashing success. I made a huge batch of cheese grits (using a white chive-cheddar that was horrible on its own, but quite tasty in the grits), a big salad and pan-grilled batches of all four sausages for dinner. I don’t have a “favorite” from the group because all were so different (or familiar) and tasty in their own right. I did make wontons with some of the leftover Asian sausage mix (there’s about 1 or 2 cups of the mix leftover in each batch b/c the stuffer doesn’t push out every last bit). 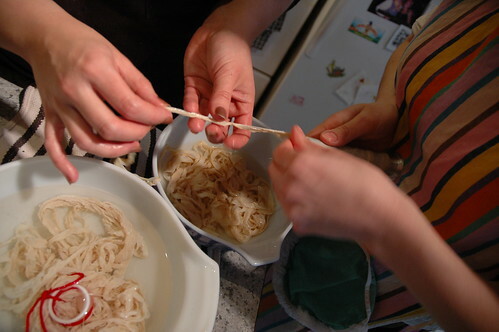 A Cantonese friend showed me how to make easy wontons for soup on a stopover in Lawrence, KS, during the book tour, and I still can’t believe how simple they are to make. 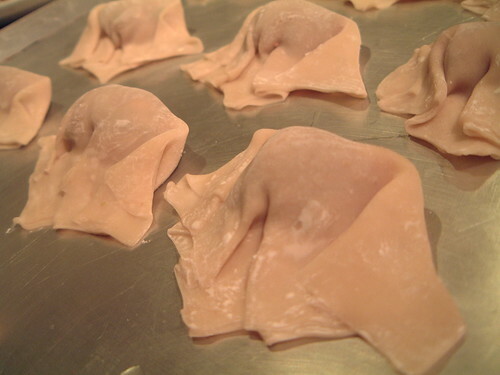 This style of dumpling is now officially on my “why buy frozen when you can make ‘em better yourself?” list. They’re not as hard to make as you’d think, and the results are infinitely more delicious than the frozen. Now, if I could only master the art of soup dumplings…. It's hard to figure out a good end to a post like this, but I thought I might wrap this up with a list of things I'd do differently for the next sausage party. 1. Make fewer types of sausage. Although it was nice to have a 'heritage' sausage party, cleaning The Beast between batches proved to be exhausting, and my hands are still chapped. I might do two different recipes, but not four. 3. 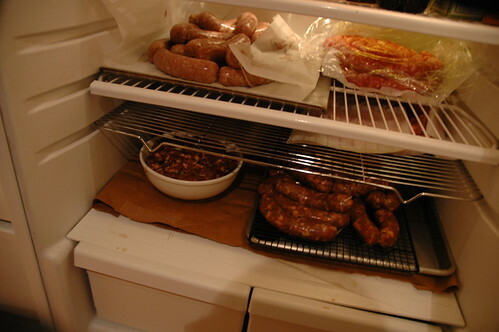 Only make sausage on cold-cold days if you have a small, crappy refrigerator. I, too, have read all of the warnings in “Charcuterie” about keeping the meat cold to keep the fat from smearing. But a crappy rental apartment refrigerator doesn’t have room for 40 lbs. 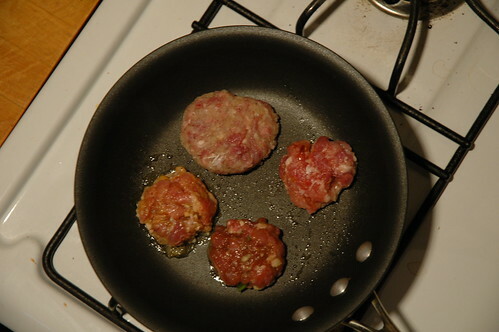 of ground meat in various stages of sausage-making. We kept everything outside--in a cooler or covered in stainless steel bowls--and it all stayed ice-cold (to the point that our hands went numb when mixing or loading the meat). 4. Be brave. Mix in more pork fat nubbins. 5. ONLY EVER buy pre-tubed casings, no matter what the price. 6. 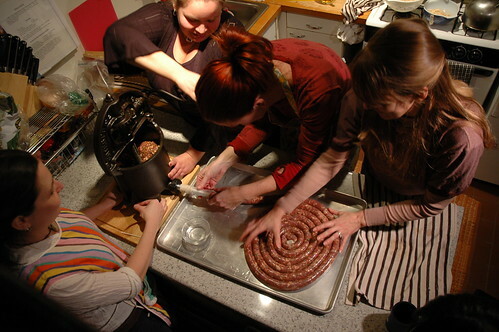 Make friends with someone who knows how and has room to dry/age sausage. 8. Don’t let the photographer drink too much. We have 100 pictures of mixing the first batch of sausage, but none of us at the end of the night actually eating the sausage. 9. Invest in a vaccu-sealer. Sucking the air out of 30 Ziploc bags isn’t fun. 10. Don’t eat homemade sausage at every meal for three days straight, no matter how delicious it is. Last edited by crrush on February 15th, 2007, 11:55 am, edited 1 time in total. Wow! 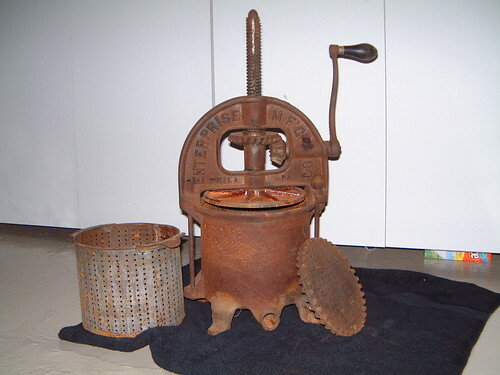 what you went through to refurbish your stuffer is pretty impressive but making the sausage is even more impressive! What a great way to honor your family traditions and to honor your uncle! I hope it all tastes wonderful! crrush wrote: I bought 60+? lbs. of pork shoulder at Halsted Packing House and had them bone-out, trim and grind the meat (a coarse “chili” grind), so I ended up with about 40 lbs. of ground pork. The butcher ground the meat and fat separately, which allowed me to “add” as much or as little fat to each recipe as desired. I probably didn’t add as much fat as I should’ve (the sausage is a wee on the lean side for my taste; everyone else seemed to like it fine), but the smell and sight of a bag full of ground pork fat nubbins is not for the faint of heart. You are a f'ing genius! Sausage making would be so much easier to do if the meat was pre-ground to my specs. Was there any major up charge for this service? Not to say using the KitchenAid grinder attachment is that big an issue, but for large quantities, it sure would be easier not to have to. Plus I take more pride in end result than the grind. Although everyone assures me that the Kitchenaid motor can withstand a long bout of grinding, I'm still not convinced. 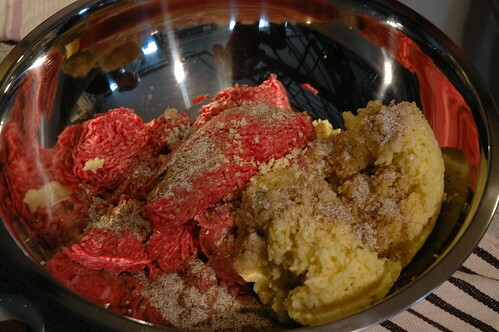 Plus, as you note, grinding that much meat is just tiresome. I don't think I paid extra for the grinding, but I could very well have...and it would still be worth every cent. I paid $90 total (or about $1.35/lb.) for the meat--boned, ground, fat-separated, etc. I'm not a bargain-hunter when it comes to this kind of stuff, so I might've overpaid. crrush wrote: I paid $90 total (or about $1.35/lb.) for the meat--boned, ground, fat-separated, etc. I'm not a bargain-hunter when it comes to this kind of stuff, so I might've overpaid. I'd put that into the one hell of a bargain range, considering $.99/lb is the lowest I ever see it, and that is a rare sale. Thanks for the great piece of info! Glad to hear it was a good price. It seemed about right, but I'd never purchased 60+ pounds of any kind of meat before. I don't know if this is a plus or minus in your book, but Halsted Packing smelled like a barnyard when I went in. They do 'live kill' butchering, which is why I chose it over the other places I checked out. I'm still freaking out over those pre-tubed casings. Have you ever used or seen those? crrush wrote: Glad to hear it was a good price. It seemed about right, but I'd never purchased 60+ pounds of any kind of meat before. I have really only been to Peoria Packing for pork products and Excel for briskets. Never tried any of the other packing houses as I never really had much of a reason until now. I am far from a sausage making expert as at this point you have now made more of it than me. 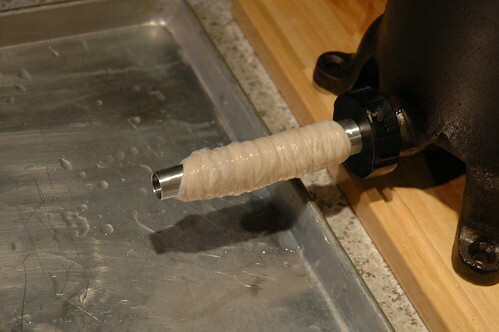 I did not really have any problems with getting the casing on the feeder tube though. I bought a hank online that came in a small pail and was salted. Once they were soaked for a bit they slid onto the tube very easily. The only nighmare of it is seperating out the tangled mess of casings, in which case the stuff you used would come in handy. Do they have a shelf life if you get more than you need in that format? The guys at F&O said that as long as they're salted well, the pre-tubed casings will last as long as regular. I only used/soaked what I needed, but I sprinkled more salt on the leftover casings before I re-froze them. The "tangle" factor is really what I'm talking about when I speak of the hassle of hanks. Just too much potential for getting tangled, which is the last thing I want to sort through when there's sausage to be stuffed. What a great report. I'm sure you had a great time. 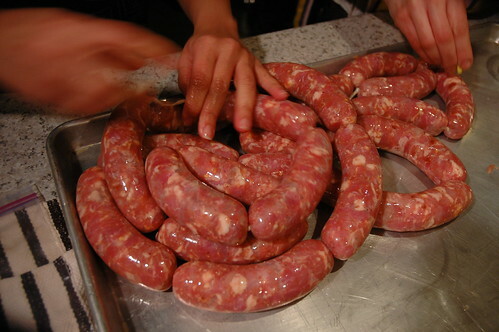 Making sausage is a fun activity. I've never heard of pre-tubed casings, but what an invention. That in itself is worth a few extra dollars. One tip when the sausage plate is too small is to cut out a piece of hard plastic from a milk jug, etc. and use it as a seal between the plate and the meat. 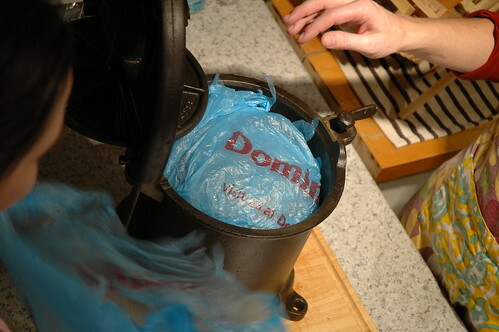 The plastic bag idea did its job though. "Oh, oh, oh, oh, ohhhh"
A really great post, inspiring and wonderfully detailed. Thanks. Pre-tubed casings are right up there with the light bulb and sliced bread, though I am wondering what the ones you bought from Fox and Obel were made from. They look natural, but with a pre-tubed product I'd be concerned they were of the artificial type. crrush wrote: 8. Don’t let the photographer drink too much. I just assumed they were natural casings. They look natural (with the white, vein-looking streaks...ew), and when cooked, had texture I'm used to, but I don't know what artificial look like in comparison. How would I differentiate? Are they wet? If so they are natural. If not they are made out of collagen and will be sort of papery. Definitely 'wet'. They're salted, which is what keeps 'em moist, so if that's the determining trait, they're au natural. I don't know why, but I find the fact that there's an International Natural Sausage Casing Association...hilarious. I particularly like the illustrations. I bet with a little bit of sleuthing, they'd tell you where other pre-tubed casing purveyors are around Chicago. Those illustrations are givin' me a hankerin' for a steamy heapin' helpin' of boiled bung-caps! crrush wrote: Definitely 'wet'. They're salted, which is what keeps 'em moist, so if that's the determining trait, they're au natural. Au natural they are then. Pre-tubed natural casing, very cool. Looks like there is a trip to Fox and Obel in my near future. This is super cool and the post was really great. Thank you! On a episode of good eats, Alton Brown said collagen casings were as good as natural casings but easier to deal with. Is this true? 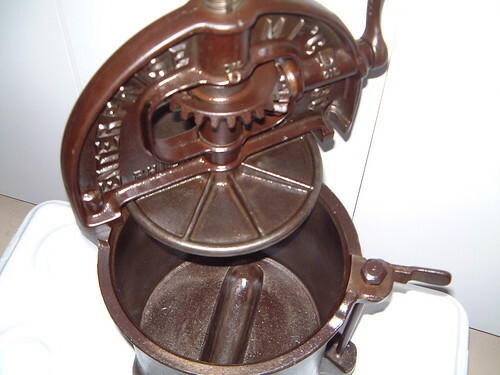 I just got a sausage stuffer for my mixer and I am excited to try it out. october271986 wrote: This is super cool and the post was really great. Thank you! IMO, there is no substitute for natural casings and they are superior. 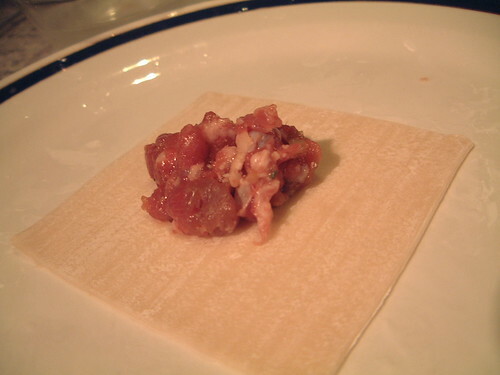 There are, however, some applications where using collagen makes sense but fresh sausage isn't really one of them, IMO. There's not an artificial casing extant that gives you the Ultimate Sausage Satisfaction: "pop!" when you bite into it. october271986 wrote: On a episode of good eats, Alton Brown said collagen casings were as good as natural casings but easier to deal with. Is this true? 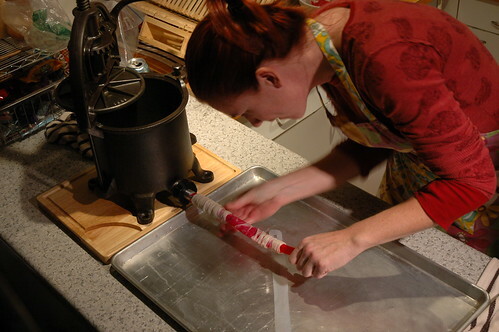 I've tried collagen casings once in my sausage making. Exactly once. I hate them. They are nothing like natural casings. Good to know. Anywhere else in the city to get pre-tubed casings other than F&O? Or Evanston? Paulina has casings, but not pre-tubed. When I called INCSA, I asked if they knew of any other retailers selling pre-tubed casings. Nada. crrush wrote: Paulina has casings, but not pre-tubed. When I called INCSA, I asked if they knew of any other retailers selling pre-tubed casings. Nada. I went to F&O yesterday and bought some casings there and fired up some italian sausage. It was fun and delicious. How much did you pay for the casings? I'm curious if they're sticking to their original quote of $4/pound. Wonderful post- I'm sure you all had a great time. Looking at your equipment, I think it would have taken me, with my rinky-dink equipment, about two hours to make them shiny clean and ready to season.